Since March 3, 1873, the US Department of Veterans Affairs (VA) has furnished government headstones or markers for unmarked graves of deceased eligible veterans. At first, this applied only to burials of honorably discharged Union Civil War veterans in national military cemeteries. But on February 3, 1879, Congress extended the benefit to veterans interred in private cemeteries. In 1906, Congress authorized the furnishing of headstones for unmarked graves of Confederate soldiers. Veterans of all subsequent conflicts are eligible for the headstone benefit. Where a headstone already exists, applicants can request a medallion to attach. Dinson A. Caldwell, c. 1865. Photo courtesy of George Seitz. Applications for VA headstones are on microfilm at the National Archives and Records Administration (NARA). Digitized applications are available in two databases on Ancestry.com: Headstones Provided for Deceased Union Civil War Veterans, 1861-1904, and Headstone Applications for Military Veterans, 1925-1963. Ancestry.com Library Edition is available free to library card holders at any Cabarrus County Library branch. While headstone and medallion application forms, filled out by next-of-kin, can provide excellent information for your family research, they can also bring to light questions for further study. Information provided by an applicant was meticulously checked by the VA for accuracy and to ensure the veteran had honorably served or received an honorable discharge. The above 1932 headstone application, made for Confederate veteran Dinson Alexander Caldwell, using information provided by his daughter, Mary Catherine "Kate" Caldwell Propst (wife of William F. Propst) reveals discrepancies with information found in other records. The notes in red were made by the VA.
"Dinson" is the name confirmed by the VA. His name is often spelled "Denson" in other records. The middle initial "A," for Alexander, was added. Dinson Caldwell was often referred to as "Major" subsequent to his service, however, this was not his Confederate military rank. According to his obituary (Concord Daily Tribune, December 19, 1914, p.1), he was a major on the staff of the organization North Carolina Confederate Veterans. The VA officially recognized him as Second Lieutenant, Company H, 35th Regiment of the North Carolina Infantry. Caldwell's date of death is shown as December 18, 1914. According to the obituary and his death certificate, the date was actually December 19, 1914. Dinson Alexander Caldwell was born in Cabarrus County on July 27, 1831, the son of John Caldwell and Mary Allen Caldwell. He grew up in Mecklenburg County and learned the construction trade in Florida. He then returned to North Carolina and married Harriet Miller. With the outbreak of the Civil War, Caldwell enlisted in 1861 with Company F, 5th Calvary, in Mecklenburg County, and later served in Company H. At the time of his death in 1914, Caldwell resided at 68 North Spring Street, Concord. He was survived by seven children: Mary Catherine Propst, Janie Denison Glass, Dr. Paul Caldwell, Young C. Caldwell, Garah Bruton Caldwell, Ruth Eumenas Hastings, and Wilna Gray Caldwell. For more information about ordering a military headstone, marker or medallion, see the VA website: https://www.cem.va.gov/cem/hmm/index.asp . 1. "Military Headstone Application," by George G. Morgan, Family Tree Magazine, December 2017, p. 64. 2. 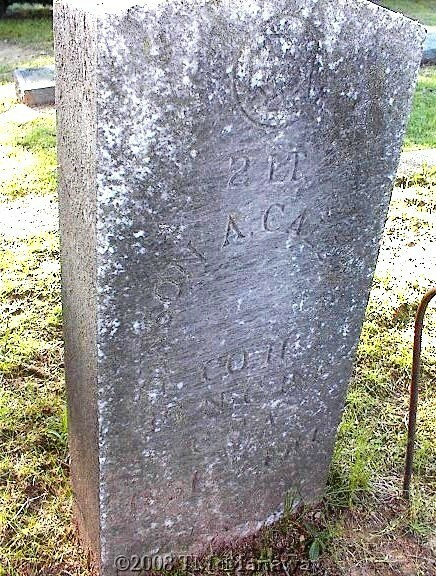 "Denson Alexander Caldwell", www.findagrave.com, Memorial ID: 44700674. 4. "Dinson A. Caldwell," U. S., Headstone Applications for Military Veterans, 1925-1963, www.ancestry.com. 5. 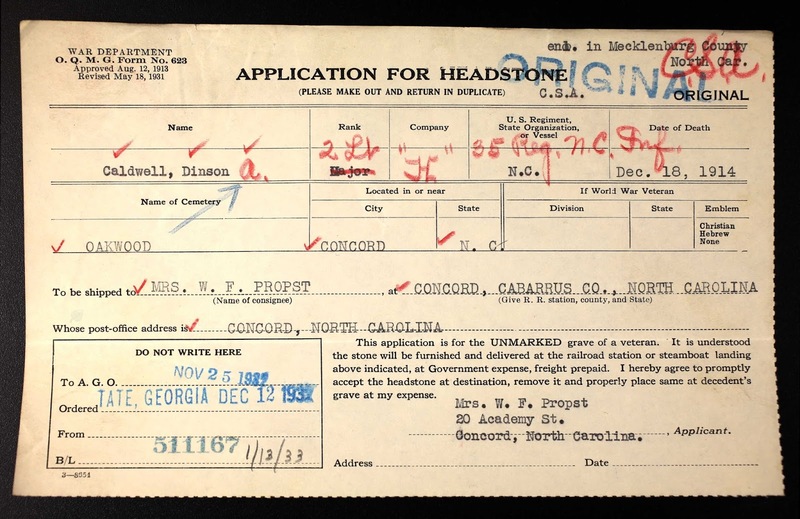 "Denson A. Caldwell," North Carolina, Death Certificates, 1909-1976, www.ancestry.com. 6. Concord, North Carolina City Directory, 1913-1914.